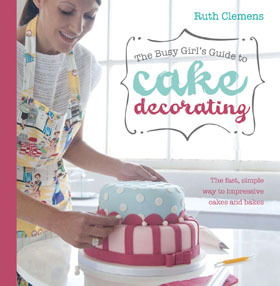 ← Marble Cake and a lesson in cake making! I thought I would use this cake to test out my new tin. 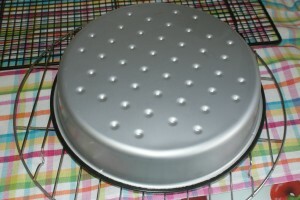 A Tefal AirBake cake tin. We used some of the range on The Great British Bake Off and because I’m a swine for buying tins, in all shapes and sizes I wanted to put it to the test at home. You will need two 8″ or 9″ tins. 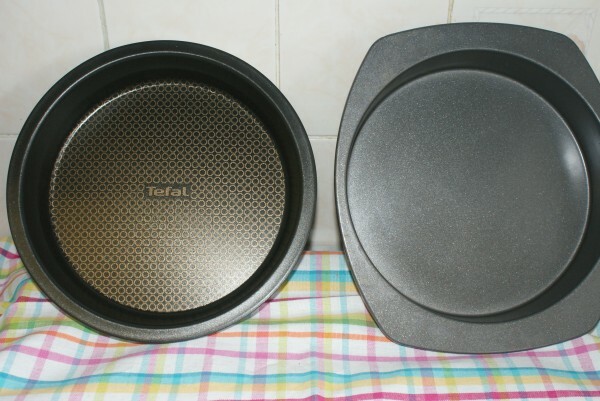 I am comparing the Tefal AirBake to a trusty tin I already have. The AirBake range comes in all sorts of sizes and they do handy loaf tins, tart pans and baking sheets too. Their main selling point is that they ensure no burning and even baking….well lets see, back to the cake in hand. Grease both the cake tins (I have to admit here to cheating with my old tin, I lined the base too knowing that I wouldn’t get the cake out of the tin whole if I didn’t! The Tefal wasn’t going to get the same failsafe treatment! Cream together the butter and dark sugar. When thoroughly creamed add in half the tin of caramel and mix again. 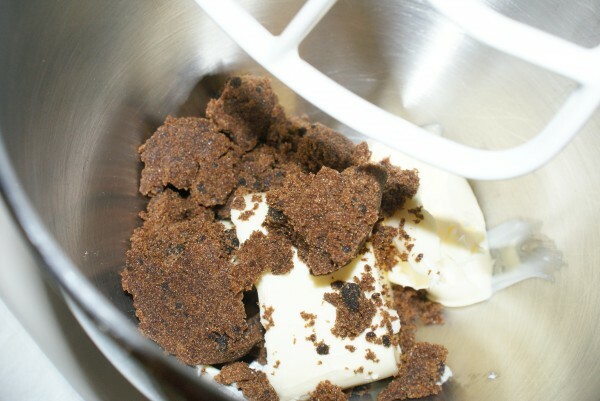 Beat the eggs together and mix slowly into the butter/sugar/caramel mix adding a spoonful of flour at any sign of curdling. Add in the remaining flour and mix together. Split the cake mix between the two tins. Level the top of the mixture and bake in the oven for 25-30 minutes at 160c Fan/180c/Gas Mark 4 until golden brown and cooked through. Remove from the oven and allow to cool for a couple of minutes. 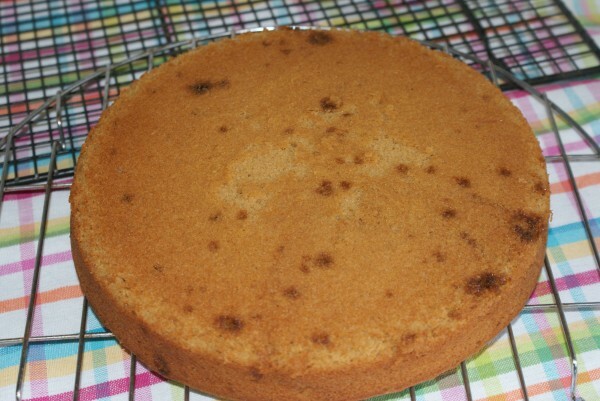 Now is the moment of truth – the AirBake cake has baked beautifully but will it release from the tin? Ta Da! Straight out of the tin and only a tiny tiny bit came away with the tin. Okay then, I’m impressed! 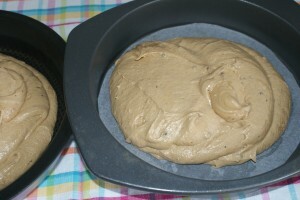 Allow both cakes to cool completely and then make the filling. Mix together the softened butter and icing sugar, when fully combined add in one spoonful of caramel from the remainder in the tin. Spread all over the top of one of the cakes. 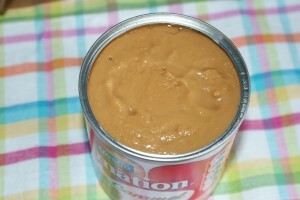 On top of the butter cream add another couple of spoonfuls of caramel and spread it out nicely. 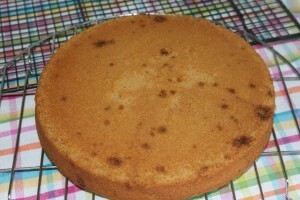 Place the second cake on top and now mix up the icing – icing sugar, water and the remaining caramel in the tin. Place the two Daim bars in a sandwich bag and bash them up until they’re lots of little bits. 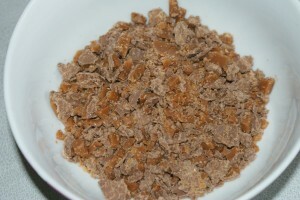 Pour the icing over the top of the cake and top with the crushed Daim pieces. 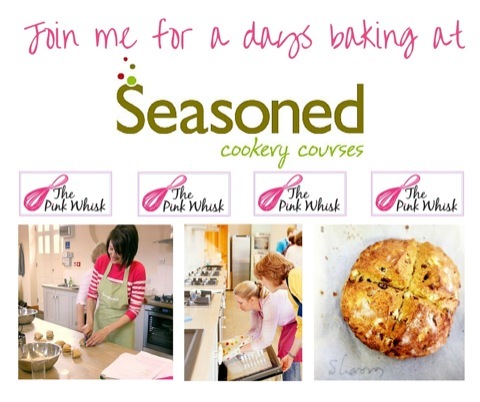 I would thoroughly recommend the Tefal AirBake range – I am off to buy some more (shhhh! don’t tell my OH!). This entry was posted in Cake, Caramel, Treats. Bookmark the permalink. I too love buying cake tins, but have to stop myself because I already have a cupboard full, some of which are quite old. I also, always, cover the sides and the bottom of all tins when baking, because,I know they will never come out in one piece if I didn't.Perhaps it's time I bought some new ones. 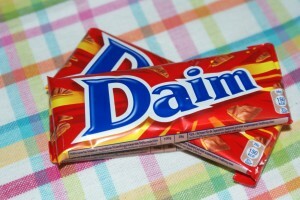 I love Daim bars so I am def going to give this a go. Oo I'm always wary of new tins and was secretly hoping your old tin would come up trumps all the way through this post. I have really old tins and use the old method gease and flour and absolutely nothing sticks to them (touching wood now I've said that). Daim bars and cake? I would have to demolish the whole thing if I made it! Looks delish Ruth. I really want to try this recipe – what size eggs did you use please? Just a quick follow up to let you know what temp to bake it at! Thanks for a great recipe, "Yummy" "This is delicious" " You can make this again Mum"….I think they liked it! Well done Ruth! Oh my goodness – had this today and it was DIVINE!!!! I've made it… it may be the first time but it won't be the last… AMAZING!!! Thank you Ruth! Made this today and I'm hooked, what a fab cake. Made it in my tins which were smaller than your so ended up with a deeper cake. Still have filling and icing left over so I'm going to make a batch of cupcakes with it tomorro! Take a look at my photo of it. I think i would love this but got a sneaky feeling my oh would say it was too sweet. Any ideas to 'tame it' a litte so I can still make it and enjoy it but so will he ?? I made this last weekend, absolutely delicious! So sweet, my favourite. I have one slice left to savour this evening. Been meaning to make this since September but something eles always got in the way (i.e dime bars had already been eaten before I could preheat the oven). Finally made it this afternoon to make up for a disappointing pub lunch, it was heaven. My daughter's want to say a big thank you for such a lovely treat!! hello… i would like to know what a 'daim' is because i havent seen it in any supermarket. i live in birmingham…. what other chocolate can i use? You can get Daim bars in Ikea – they used to be called Dime bars. This cake is now a firm favourite of mine! 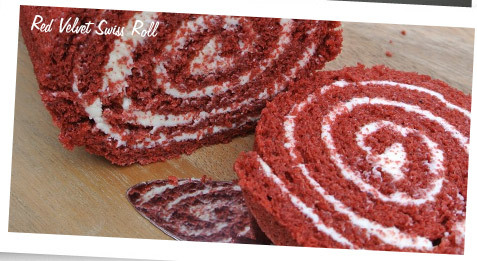 I have kept meaning to try this recipe and made this to take into work and it went down a storm! Soooooo so yummy!! I will definitely be making it again! 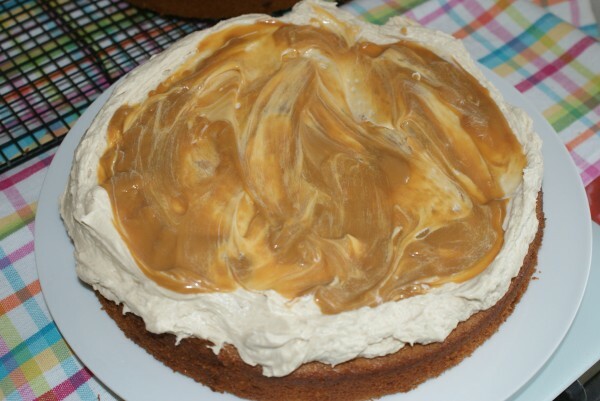 What a treat, there was so much mixture that I made a three layer giant, I changed the filling to a cream cheese and vanilla buttercream drizzled with caramel. My daughter says that it is now her favourite cake. Oh, 1 thing. I am staying with a friend at the moment and she has a gas oven, I have only ever baked in a fan oven, do you think it will still work out fine? I hope so. Thanks again Ruth. 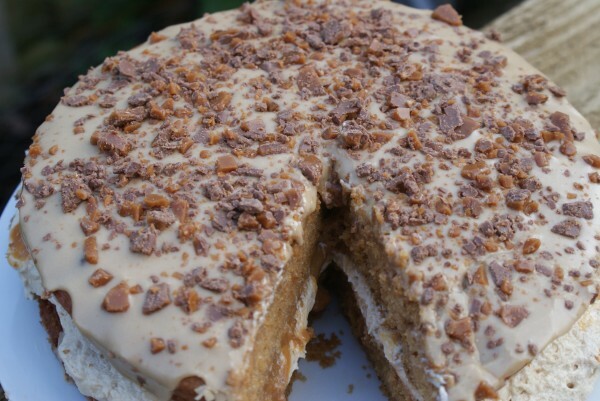 Is it just me or has the method for the caramel Daim cake disappeared since the new website was live? I can only see to the photo of new cake tins? Thanks Ruth. And then I’ll do your effort justice by making it 🙂 Looks scrummy! I am guessing 160 for fan oven? I made this cake last year for a Children in Need fundraiser and I’m having requests for it again this year – it was delicious! I’d like to turn it into cupcakes though – any idea how many the above quantities would yield? And was considering putting the buttercream icing on top and sprinkling with diam bars. Do you think that would work? Can I mix the caramel sauce into the buttercream? This cake looks amazing!! But I only have 7″ baking tins, how much would you suggest I reduce the quantities by? Made this and was delighted with it. Wasn’t as sickly as i expected. A new favourite in my house and my 8 year old says she would give it 11 out of 10!!!!! Made this cake and can’t believe how moist and good it tastes. My family love it. Not too sweet either. Perfect for caramel lovers!!! 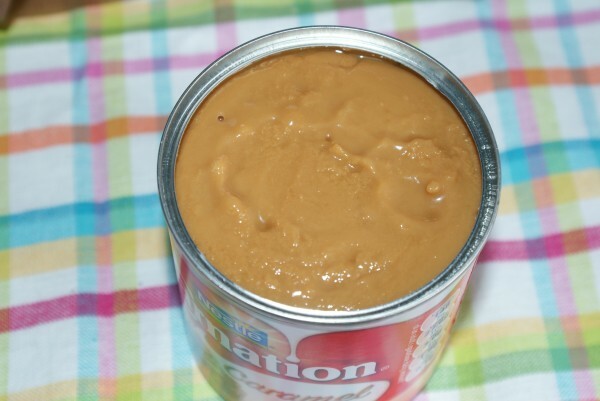 Hi, can i use thick caramel sauce sauce instead of dulce caramel sauce or is it better to do the sweetend condensed milk in the oven thing?!! Thanks!! Hiya Ruth, just made this for my daughter’s birthday today, it came out fantastic as usual with your recipes!! cant wait to see her face tonight when she comes home from work. hope you are well! !